What does Bloodstock mean to Amon Amarth? This weekend Amon Amarth will be making history by headlining a UK festival for the first time, and what better place for this monumental moment than at Bloodstock? Veterans of the Catton Park metalfest, the Viking heavyweights will be topping the bill on Friday, flanked by Blind Guardian and Kreator earlier in the day – it really doesn’t get much more metal than that! 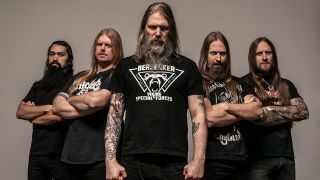 But how is Amon Amarth’s fearless leader Johan Hegg feeling about their biggest UK headline show of all time? We gave him a call to find out. What does Bloodstock mean to you? What is it about Amon Amarth that connects so well with the Bloodstock crowd? What did you think the first time you saw Epic Viking Rowing? How does it feel to be headlining your first UK festival? Was getting big in the UK always a plan for Amon Amarth? Have you got any special production lined up for Bloodstock? Who do you recommend people should check out at Bloodstock? It’s quite a theatrical weekend with you headlining the Friday and Ghost headlining the Saturday! Bloodstock takes place at Catton Park, Derbyshire, on August 11-13, with Amon Amarth headlining the Friday. Weekend tickets are now sold out but day tickets are available. What have Arch Enemy got in store for Bloodstock 2017? How do Ghost feel about headlining Bloodstock 2017?